Why Do Liveries Have Military Associations? Some people ask, ‘Why do livery companies have military affiliations?’ I think the best summary is that livery companies represent the United Kingdom’s industries and as a trading nation the UK needs to defend its trade routes and the country. It is important that we recognise that link. The military enjoy our “spirits” and we gain a valuable insight into their operations. I had a chance to discuss 2018 with Commander Conor O’Neill of HMS Montrose. The ship has a busy few months ahead in the Baltic and will also dock at Montrose itself. Liverymen may well have an opportunity of a four day sea ride from Montrose to Cornwall in the summer. Later in the month it was my pleasure to present the Distillers Trophy to the best engineer on the course at 825 Naval Air Squadron based at RAF Yeovilton. The professionalism and hard work, to keep the Navy’s Wildcat helicopters flying, was clear. It was fun to be joined by David Raines, Ewan Lacey and Jonathan Clark’s family, who had kindly entertained a group from 825 at their distillery last year. Then onto our industry awards with the Wine & Spirit Education Trust. Ian Harris MBE was in his element hosting this gala awards’ ceremony. I presented awards to Fiona Macdonald, who is the distillery guide on Jura, and Marina Kamburova, who won the Diploma award and is originally from Bulgaria. One of the burdensome tasks of a Master is lunches and dinners! It was great to see a full house at Vintners Hall for the Wine & Spirit Benevolent lunch, where I sat next door to the Master Vintner. 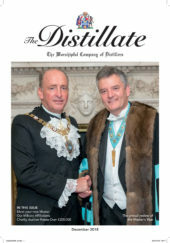 Later in the month I attended a dinner at Goldsmiths Hall for the Tobacco Pipe Makers, whose Master Ralph Edmundson is an old acquaintance from my City days when he was Head of Investor Relations at British American Tobacco. The snuff at the end of the evening had a kick like a mule! That night I sat next door to Alderman Fiona Adler who is our link on the Livery Committee. It is helpful to have a two way dialogue between the Corporation of the City of London and our own Company. I have also been involved with a Pan Livery Working Group which is looking at the communications both internally and externally for the Livery movement. Finally I attended a presentation by the Arts Society on the relics and artifacts of St. Lawrence Jewry. No Canon David Parrott was not one of the relics! It was fascinating to see that St. Lawrence houses many artefacts from churches long since knocked down in the surrounding area. It gave a great background story of the City’s history.